Built in Ambli, SG Highway and Surroundings, Altius Vibe is a residential development by Synthesis Spacelink. The project is sufficed with all modern amenities and covers 3BHK apartments. Being close to all necessities, it has good connectivity to the rest of the city. What is the location of Altius Vibe?The location of the project is Ambli, SG Highway & Surroundings. What size of flats are available in Altius Vibe? 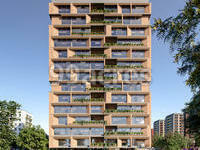 The apartment size in the project is 3046.0. What is the 4 bedroom size in Altius Vibe? Four-room units (4BHK) in the project are available in an area of 3046.0 sqft. What is price of 4 bhk in Altius Vibe? 4 BHK apartments in the project are available at a price of Rs. 34898022 to Rs. 35501130. What is the existing price in Altius Vibe? Apartments in the project are priced within Rs. 34898022 to Rs. 35501130. What is expected possession date of Altius Vibe?The developer plans to handover the project by Oct 2021. Synthesis Spacelinks is real estate developer based in Ahmedabad. The builder group was incorporated nearly four decades ago and has been providing real estate solutions ranging from commercial condominiums to holiday homes ever since. It offers a wide spectrum of property units, including contemporary business arcades to lavish living spaces. ts. Project Suramya -7 has received the award for the ?Best Maintained Plotted Development while projects Suramya Abode and Altius III have each received the 5 Star CRISIL Rated Project awards. The success of Synthesis Spacelinks can be attributed to its team of professionals, which includes highly experienced and energetic engineers, legal experts, construction pros, marketing professionals, architects and structural designers.